For the past few years, we’ve been hearing about the benefits of kale. Doctors praise how nutrient-rich it is with its high levels of antioxidants and vitamins A and K, but the slightly bitter taste can be hard to swallow. 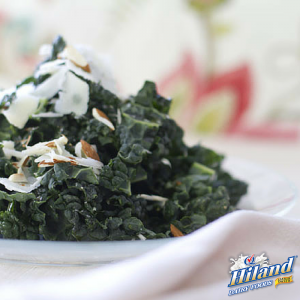 At Hiland, we’ve created a recipe to make getting all those nutrients a little bit tastier. By adding lemon juice, red onion and just a touch bacon, you’ve now got a whole new way to enjoy this tried and true superfood. Plus, with Hiland Dairy Orange Juice in the dressing, you even get an extra kick of inflammation-reducing antioxidants which will really help to push this salad’s healthy attributes over the top. In a large bowl, combine kale with carrot, orange juice, lemon juice, salt and black pepper. Let stand a few minutes to absorb flavors. Fill a bowl with ice water. Fill a small pot with water and bring to a boil. Add onion and boil for 15 to 30 seconds or until slightly softened. Remove onion and place in ice water. Drain the ice water, dry onions on paper towels and add to kale mix along with bacon, mayonnaise and olive oil. Toss to coat. Refrigerate until serving time.